Listen to this audio dialogue between Ervin Laslo & Marc Gafni. The topic is Evolutionary Love. 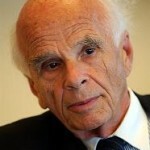 Ervin Laszlo is a Hungarian philosopher of science, systems theorist, integral theorist, originally a classical pianist. He is the Founder and President of The Club of Budapest, Director and Co-Founder of the Ervin Laszlo Institute for Advanced Study (ELIAS) and of the Laszlo New-Paradigm Leadership Center (Italy)… He is the author or co-author of fifty-four books translated into as many as twenty-three languages, and the editor of another thirty volumes including a four-volume encyclopedia. Marc Gafni is the Co-Founder and President of the Center for Integral Wisdom, the author of many books including the award winning Your Unique Self, a visionary scholar and integral wisdom teacher. “…everything that happens from the original Big Bang in this universe or in prior universes, when things fall together and move together and create wholes, larger and larger, more and more complex wholes which more and more interact, more and more communicate with each other, and they are really entangled as a physicist would say.